I have a guest editorial piece in today's Palladium-Item, End risky economic games. I've also reproduced the edited version of the piece below. I had originally hoped to title it "What can James Bond teach us about economic development?" but I decided that's not actually a question I want to know the answer to. So instead the article focuses on two different labels for economic development models, coined by author Michael Shuman. I first saw Shuman speak at a conference back in 2005. He's an economist, attorney, speaker, author and entrepreneur, and he's written a number of books on the economic why and how for creating thriving, self-reliant communities. In particular, he posed the labels of "TINA: There is no alternative" and "LOIS: Local Investment and Import Substituting" as shorthand names for the dominant economic development model of today (TINA) and an alternative model that he sees having great success and sustainability on paper and in practice (LOIS). You might open a newspaper soon to see an ad like the one at right which appeared in my local paper a few days ago. 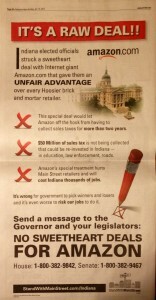 It encourages you to "Stand With Main Street" to protest "special treatment" of Amazon.com that allows them to forgo the collection of sales tax on online purchases, resulting in an unfair advantage over "every Hoosier brick and mortar retailer." I don't usually see full-page ads related to Internet commerce in a market this size, so I thought I'd investigate the issues at stake. The question of taxing e-commerce transactions is a bit complicated to be sure. If you have a strong and concisely-worded position on it, you're probably running for national political office, or a Libertarian, or both. On one hand we can see the clear financial and psychological advantage that an online retailer has with customers who are weighing a purchase from a local store that charges tax against an online store that doesn't, and maybe offers the item at a slightly lower price too. 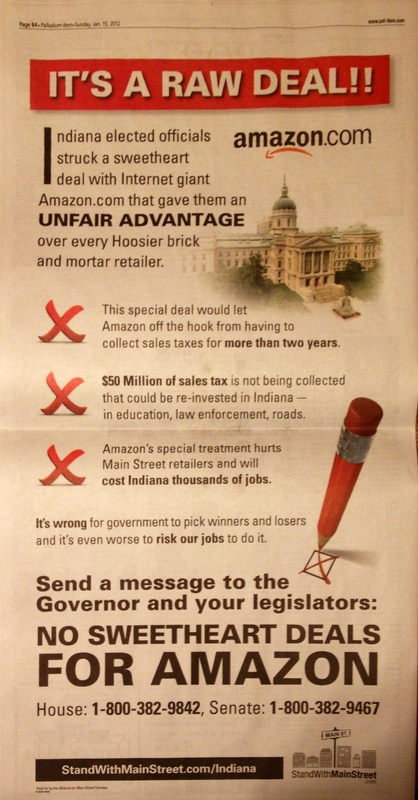 At the same time, that online retailer may be benefitting from the infrastructure that sales taxes others are collecting help pay for (setting up warehouses, trucking goods around state roads, etc.). On the other hand, we know that laws around state sales taxation were created prior to the age of the Internet and that the models of online business and affiliate sales have completely changed the way the world does business, and current attempts to rewrite them in order to create short-term bandaids on ailing state economies are probably not in the best interest of business innovation, especially when they favor large retailers (online and off) and send small businesses and people who make a living as Amazon.com or eBay affiliates into a quagmire of tax collection bureaucracy. In early January, I published a blog entry noting that Tom Amyx, owner of Tom's New York Deli here in Richmond, wanted to give away his restaurant to someone who could carry it forward with a positive and exciting vision. It turns out that my blog post generated quite a few inquiries to Tom about doing just that. A local couple, Ron and Rachel Hughes, saw my post, talked to Tom about the possibilities, and are now taking over ownership of the Deli as of this week. I love this city! Thanks to Tom, Ron, Rachel, and the entire staff of Tom's Deli for living out a great vision for small business and community building in Richmond, Indiana. Would you like to own Tom's New York Deli? Tom Amyx is giving away the business he spent the last 20 years of his life building. This morning when I spoke with Tom, the owner of Tom's New York Deli here in Richmond, he talked of troubling health issues and financial factors in his decision, but he seemed as energetic and excited as ever. He opened the restaurant in December of 1991 and it's been a fixture on Main Street in the downtown business district ever since. Professionals, passers-through, families and sports teams alike frequent the establishment, which is known for its great sandwiches, corny jokes and extensive collection of local and national memorabilia. But as he looks toward the next phase of his own life, instead of trying to sell the small restaurant to the highest bidder, or close it down altogether, he's ready to give it away to the person who would bring the best vision for its future. Why can't those downtown merchants get it right? There's an interesting and sad article in today's Palladium-Item, Main Street struggles for survival. Articles like it are being written about struggling downtown areas across the country, so of course it's nothing new in "this economy," but because it's about the downtown in my community, I take special notice. The article contains some interviews with downtown business owners, some perspective on the history of the Main Street organization there, and some talk of renewed activity from merchants and business owners (myself among them) in helping make the area thrive. But there's something missing from the picture the article paints. There's a new amusement park ride opening up in town! It'll take you on a thrilling journey through ups and downs of successful projects, communication failures, happy long-term partnerships, and total failures in competence. It's called THE CONTRACTOR EXPERIENCE and you can hop on it today by opening up the phone book and calling pretty much any contractor you want to try to get some work done on your home or business! "If you read my previous post about 10 Reasons to Work at Summersault, you may have noted Reason #5: In-depth performance reviews provide you with concrete professional goals and feedback on your successes. As we wrap up our Fall review cycle for staff here, I thought I’d say a little more about just what that process involves." Continue reading Staff evaluations: giving feedback, building strong teams. I was glad to see today's coverage of a local restaurant owner who has made an investment in this community. [Paul] Brittenham opened the restaurant with his brother-in-law -- Lee Schwegman, thus the name -- in 1948 after surviving the attack on Pearl Harbor and five years in the army during World War II. He has kept the ham and eggs and coffee coming and the customers moving on ever since then. But Thursday was his last day behind the counter. Brittenham is hanging up his spatula and retiring at 89. It's worth noting too that today is the 15th anniversary of the opening of Tom's New York Deli, a frequent Uptown lunch spot for some Summersault staff and a place we love to take visitors. Owner Tom Amyx and his staff have always treated us well since our early days of starting up our own business in the business district, and I'm so glad that they continue to survive in the face of chain restaurants and fast food. The forthcoming closing of Richmond's Target store, reported in the Palladium-Item on November 6th, is certainly a troubling development for the local economy. Jobs will be lost, the convenient shopping will need to be found elsewhere, and yet another "big box" piece of real estate will need to be filled. This piece was written for submission to the Palladium-Item during my time on the board of Main Street Richmond-Wayne County. It never made its way to the paper, but I thought I'd post it here since it's still relevant. It still strikes me how little we knew about everything that goes into running a business when we founded the technology company I work for, Summersault, in 1997. We were very confident about the services we wanted to provide and very focused on the clients with whom we wanted to work, but had plenty to learn about accounting, legal matters, hiring employees, and all of the other necessary but complex areas of knowledge one must dive into when doing business.